We open the High Holidays with Selihot (prayers of penitence) and in the span of two and a half weeks we will have gone through the Yamim Noraim (the Days of Awe). How much of the Yamim Noraim will go through us? Will they be just another High Holidays or will we allow them to become a truly intense, creative, new and spontaneous spiritual adventure? Will we be uninhibited enough, authentic enough, daring enough to let an avalanche of emotions, feelings, memories, longings, prayers and insights flow in and out of our souls? 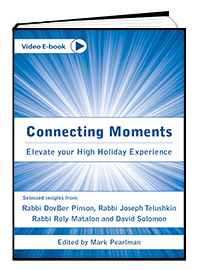 To that end, Connecting Moments is a collaboration with some of the world’s top Rabbis and teachers, who, in text and on film, share the secrets to transforming the High Holiday experience. We hope this book will help make the High Holiday time more meaningful to you – to help give you the courage to repeat what must be repeated and change what must be changed. Read on to create your own memorable High Holiday experience. L’Shana Tova.